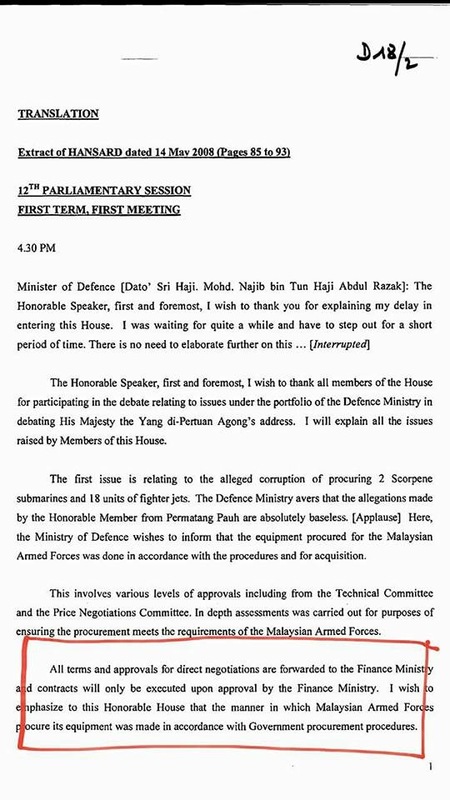 In 2008, then Deputy Prime Minister and Minister of Defence, in his reply to Wan Azizah confirmed that all terms and approvals of the procurements of the two units of Scorpene submarines and 18 units of fighter jets were made in accordance with Government procurement procedures and could only be executed by the Finance Ministry. The inking of the deal to purchase the Scorpene submarines was made in June 2002 when a now-amnesiac Prime Minister was also the Finance Minister then. In yesterday’s posting I mentioned about Ibrahim mohd Noor being Daim Zainuddin’s proxy and ran Perimekar Sdn Bhd with Mohzani Mahathir out of a bungalow at Jalan Lembah Ledang off Jalan Duta in Kuala Lumpur. The fact is that very few people know that Ibrahim had an office there, which also happened to be the base for the creation of Ibrahim’s venture into media and advertising via Blue Inc Sdn Bhd. Being close to Daim gave him the advantage of ‘privileged knowledge’ and knew when Mahathir finally agreed to to the submarine program. He teamed up with Mokhzani Mahathir and used Perimekar as the vehicle for this venture. A nucleus team was formed and started on the proposal. They went to a few reputable German shipbuilders like HDW and Blohm & Voss. However, at the end of 2001, Daim and Mahathir had a fall out. Lim Kit Siang, Mahathir’s now best friend, was very observant of this event and commented that the Mahathir-Daim fall-out is not over policy differences on whether to end the policy of bail-outs and buy- outs. 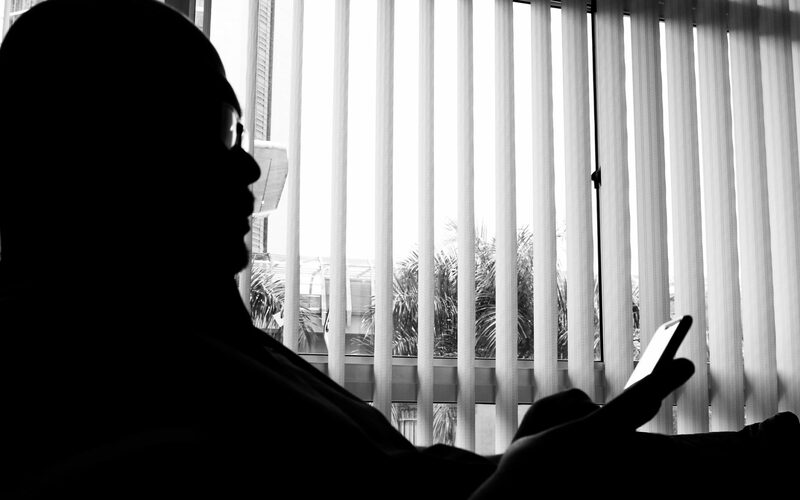 Of course, Lim Kit Siang being an old man although not yet as old as Mahathir, suffers from selective amnesia and seems to have forgiven Mahathir for all his sins to the people of Malaysia – as long as the position that gives power is within his grasp. As a result of the fall out, Ibrahim had to give up Perimekar and his quest to supply the Royal Malaysian Navy with its submarines, and Lembaga Tabung Angkatan Tentera (LTAT) took this up. At the time, Boustead was planning to take over Amin Shah’s Business Focus Group, in particular the PSC Naval Dockyard Sdn Bhd. Amin Shah, a known Daim crony, privatised the Royal Malaysian Navy’s dockyard during Daim’s tenure as the Finance Minister and injected it into a company he took over, Penang Shipyard Co.
At the time, PSC Naval Dockyard Sdn Bhd already had the contract to supply six out of 27 new-generation patrol vessels for the RMN, which happened to be a deal between PSC Naval Dockyard Sdn Bhd’s joint-venture with German shipbuilder Blohm & Voss. It seemed convenient for Perimekar then to also have another deal with a German shipbuilder especially Blohm & Voss. After Ibrahim was out of the picture and Abdul Razak Baginda’s wife was in Perimekar, the latter shopped around for a suitable submarine. The DCNS and Thales at the time had a product which was the Scorpene submarine, considered a superior diesel-electric attack submarine at the time and was constructing for the Chilean Navy. In early 2002, the Malaysian Defence Industry Council was hosted at PSC Naval Dockyard Sdn Bhd in Lumut, and Amin Shah tried to peddle two used Dutch submarines to Najib Razak who was then the Defence Minister. The submarines, the Tijgerhaai (Tigershark) and Zwaardvis (Swordfish) were ambitiously bought by Amin Shah. However, Najib Razak was not interested in having two rustbuckets for the RMN. The Scorpene had incorporated systems that are in use with the French Navy’s nuclear attack submarines, also built by DCNS and Thales. The proposal also included the very potent Blackshark II torpedoes and MBDA SM39 Exocet anti-ship missiles. Abdul Razak Baginda also managed to package together the elite turnkey submarine training with the DCI-NAVFCO at Brest. Coupled with extensive exercise exposure of the RMN officers and men with their French counterparts in the submarine force at Brest gave the RMN men an exposure to the French Navy’s role and operations as well as tactics used in NATO. Once the deal was inked in June 2002, Razak never went to Cherbourg again. And Altantuya? She only existed a few years after the deal was inked. Even a renowned Najib Razak-hater wrote in his book that Abdul Razak Baginda first met in 2004, a good two years after the Scorpene deal was done. It is interesting to note that the RMN had sent its first batch of officers for submarine training with the Royal Australian Navy in 1992. They earned their submariners’ dolphin a year later. And guess which Minister of Defence it was then who mooted the idea of having a submarine force? 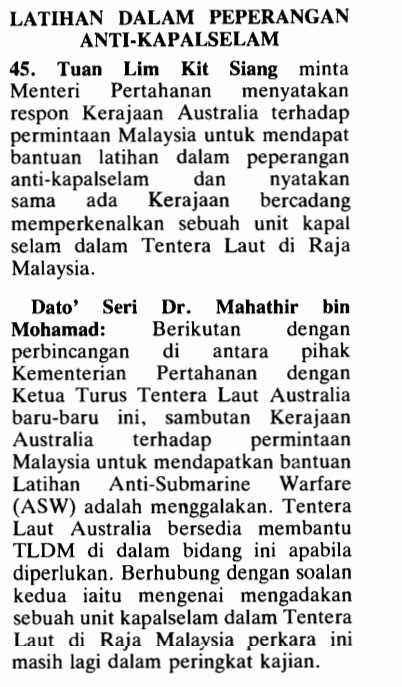 So was the plan for Perimekar laid out like a carpet a while before the then Prime Minister gave the go ahead to work out a submarine program for the RMN? It is impossible for the Prime Minister or Finance Minister then to not know about the purchase of the submarines. This is not like buying sweets at a Mamak shop. They cost billions of Ringgits that would still need the approval of the Finance Ministry. So is Mahathir not afraid of the hereafter peddling one lie after another? Previous PostPrevious Scorpene: Who Is Who And What Is What?